Led by the University of Glasgow the new digital resource aims to widen public engagement with the ongoing archaeological research in Perthshire. Supported by a grant from Historic Environment Scotland, the SERF Project app was developed in collaboration with the 3DVisLab at the University of Dundee. It incorporates 3-D images, enabling the user to grab, rotate and closely examine some of the artefacts which have been unearthed at the hillfort sites. 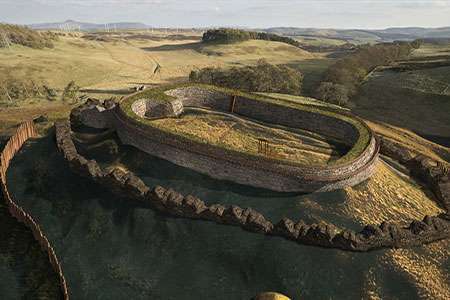 It also features drone aerial footage of the hillforts, superimposed with artist's reconstructions of what the sites may have looked like. Dr Tessa Poller, Director of the SERF hillforts project and an archaeologist at the University of Glasgow, said: "This app is about wider public engagement surrounding the work we are doing, to not only show people the geographical area where these hillforts lie but to also explain how, throughout the various discoveries we have already made, we are able to challenge perceptions about what life must have been like back then. "The drone photography and artistic reconstructions puts everything into perspective and will hopefully bring the research we are doing to a much wider audience. It can be used as an education tool for schools and in fact we have already had a lot of pupils coming to visit us on the sites, with local schools very keen to get involved." The Strathearn Environs and Royal Forteviot (SERF) Project began in 2007 in a diverse archaeological area of eastern Strathearn, located in the heart of Scotland. 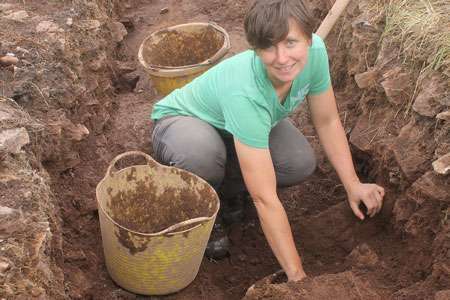 Archaeologists from the University of Glasgow have been exploring and excavating the ten hillforts which lie within the rural and remote landscape. The results of the long-term research will be published in a series of academic papers and a monograph. The new digital app aims to explore ways to present a practical approach to current issues of representation and audience engagement within archaeology, an interactive online platform which shows how archaeologists craft their interpretive narratives on site. The resulting resource showcases different ways to engage with a selection of our archaeological discoveries and the interpretations we have made from the SERF hillforts project. Dr Poller explains: "Archaeological visualisation, or the act of picturing the past in the present, is a complex area of research which exists at the convergence of evidence, interpretation, scientific data collection and artfully crafted storytelling. It is a process which at its core relies on a personal engagement between practitioner, practice and the archaeological record. "Traditional modes of representation ask for visuals which embody a somewhat conclusive and didactic voice. But we wanted to try and change that and ask how then might we use visualisation to better reflect the fluidity of the interpretive process and engage audiences more meaningfully with the ways in which the excavated evidence challenges archaeologists? This digital resource strives to explore creative methodologies and outputs which more accurately reflect the multi-layered, multi-vocal and ambiguous processes involved in archaeological interpretation."